The provincial government is expected to approve logging in the small forest immediately beside our camp that we use as our outdoor classroom. Alongside the Haida Nation, MMAC seeks a solution that would protect this outdoor classroom and maintain the integrity of our lakeside ecosystem. Location: Mount Moresby Adventure Camp!! Beginning May 2016! We are very excited about this year’s camp offerings. 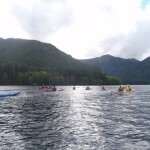 Grade 9 campers will travel to Gwaii Haanas again this year!